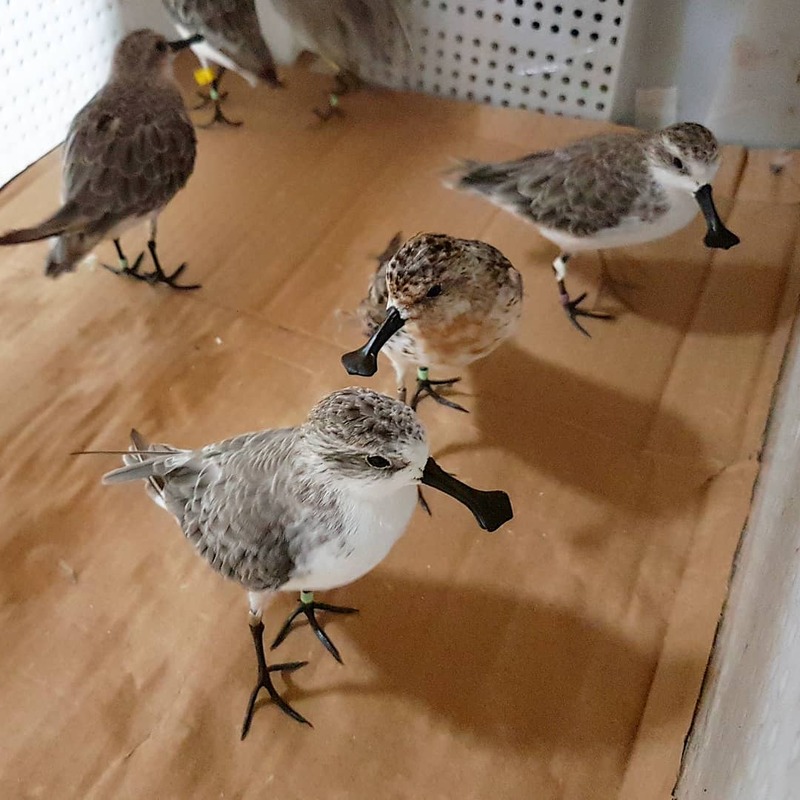 Co-ordinated efforts by conservationists, including the hand-rearing of chicks and ringing and tagging of birds, are giving researchers an unprecedented insight into the annual cycle of the Critically Endangered Spoon-billed Sandpiper. This autumn, a juvenile 'Spoonie', which was reared by a WWT conservationist in Russia as part of the organisation's long-standing 'head-starting' programme, was re-sighted by a colleague 5,000 km away in Jiangsu, China. The young bird, known as 'White 4H' after the colour and code on its left flag, was raised in Russia in August by aviculturalist Jodie Clements. Then, a month after being released into the wild, Kane Brides observed the bird in the field in China, while monitoring shorebirds at a key site along the East Asian-Australasian Flyway. 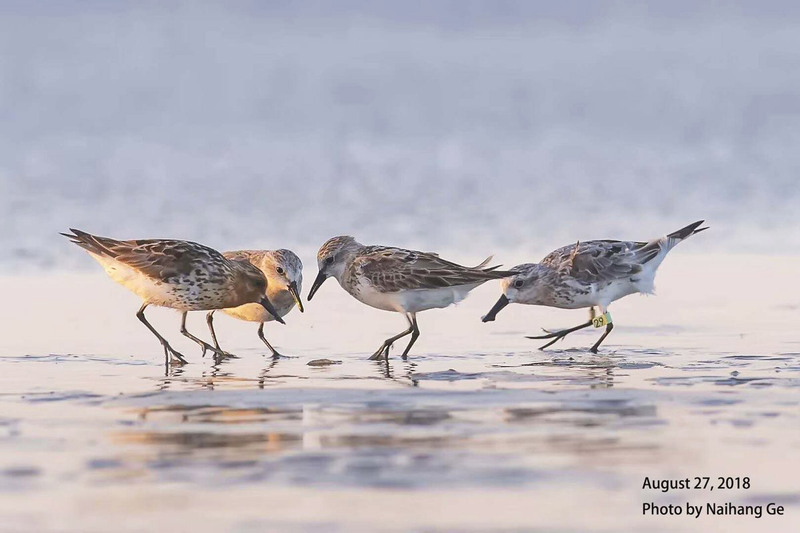 Accompanied by an international team of conservationists from the UK, New Zealand, Hong Kong and China, they caught a total of 15 Spoon-billed Sandpipers and observed 100 of the Critically Endangered waders among a large mixed-species flock, with White 4H being one of them. Kane said: "I can't believe we came across White 4H which my mate Jodie had helped care for four weeks earlier, in a completely different country. It's like finding a message in a bottle!" Two Spoon-billed Sandpipers, including a flagged bird, photographed alongside two Red-necked Stints at a staging site in China in August 2018 (Naihang Ge). The head-starting programme has been underway in Meinypil'gyno, Russia, since 2012, involving specialists collecting eggs from incubating birds in the wild, hatching and hand-raising the chicks in captivity to fledging age, and then releasing them back into the wild. WWT and its partners have now head-started 163 Spoon-billed Sandpipers (160 of which were flagged), plus tagged 118 wild chicks and 57 wild adults. This has resulted in over 800 sightings in nine countries along the flyway. A total of 12 Spoon-billed Sandpipers have now been satellite tagged since October 2016, producing breath-taking and invaluable results, such as the documentation of an overland migration route to Myanmar and a number of previously unknown wintering, staging and potential breeding sites identified. Of these, 'Lime 07' is perhaps the most remarkable. First fitted with his colour flag in 2013, he has already given researchers a great deal of data over the past six years, but this summer he was also satellite tagged for the first time. Having spent the previous two winters in Bangladesh, researchers were stunned to watch him complete a 9,000-km migration to northern Sumatra, where he has now settled for the winter. This included a non-stop 2,300-km migration from south-west China to Sumatra to complete his southward movement, which was conducted over 49 hours at an average speed of 47 km/h from 28-30 October. For more about this extraordinary feat, visit the Spoon-billed Sandpiper blog. Kane Brides summarised: "This just goes to show that head-starting is working and that it is buying time for the species. It appears that headstarted birds are surviving as well as their wild counterparts. There's a lot to be positive about." The East Asian-Australasian Flyway is incredibly important for many waders, including threatened species such as Nordmann's Greenshank and Far Eastern Curlew. By increasing the number of waterbirds that are identifiable by rings along the flyway, conservationists can better track their movements, survival rates and pick up other valuable insights that will help them better protect at-risk species. Six Spoon-billed Sandpipers trapped for monitoring purposes at a migration staging site in China (WWT).